Thanks for a great challenge last week, your Cute Characters were fun! This week our theme is Thinking of You! We're challenging you to make Thinking of You cards for our heroes to send home to their family and friends! We can’t wait to see your card creations! Our sample card maker this week is Ann, she doesn't have a blog right now so please leave her some love with your comments right here! Ann, I've always loved that set and your did it so much justice. Very, very pretty card. Thanks for the inspiration. Thank you so much Ann for being our sample card maker this week, your card is lovely! 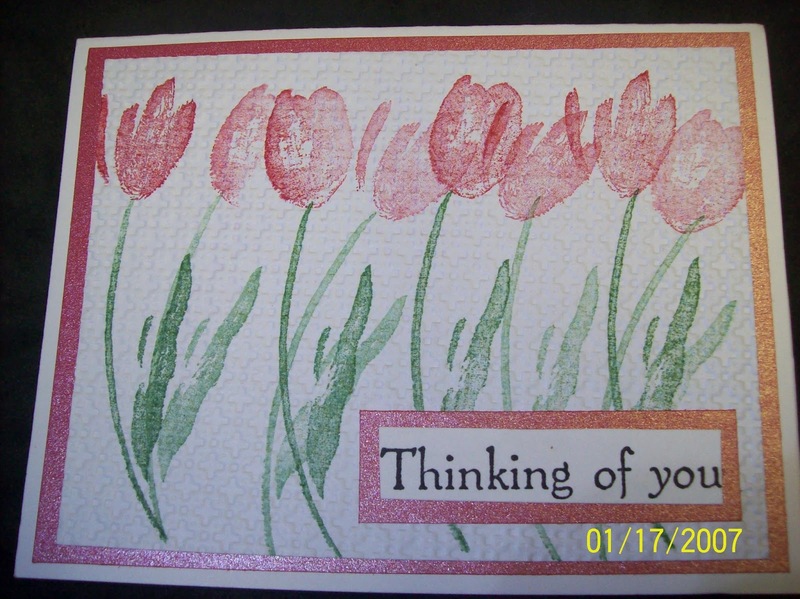 Such a sweet and gentle card Ann, love the tulips gently swaying in the warm breeze. Beautiful sample card Ann. 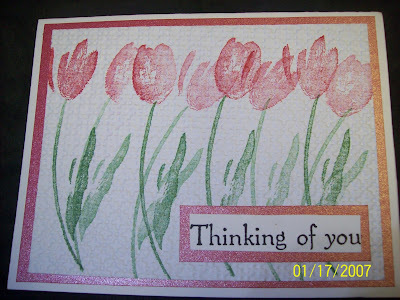 I love tulips and that 2 step set has always been a favorite of mine and the addition of the embossing is terrific! Such a beautiful card, Ann! I just noticed all the tulips blooming around here today! Love the card, so bright and pretty with spring time feel to it. This is one of my favorite sets. I really love your card! The watercolor look is so pretty! Lovely card. Beautifil spring colors with a bright cheery message. This is sure to brighten someones day. Great job! Really interesting stamps ‘posted’ on here. I hope that they got there with 1st class delivery, whatever that may cost in their native country or at whatever moment in time. If you are ready to venture forth here is another stamp collectors paradise!